BARCELONA, Spain Lionel Messi broke German great Gerd Mueller's 40-year-old record for most goals in a year by scoring for the 86th time in 2012 on Sunday. 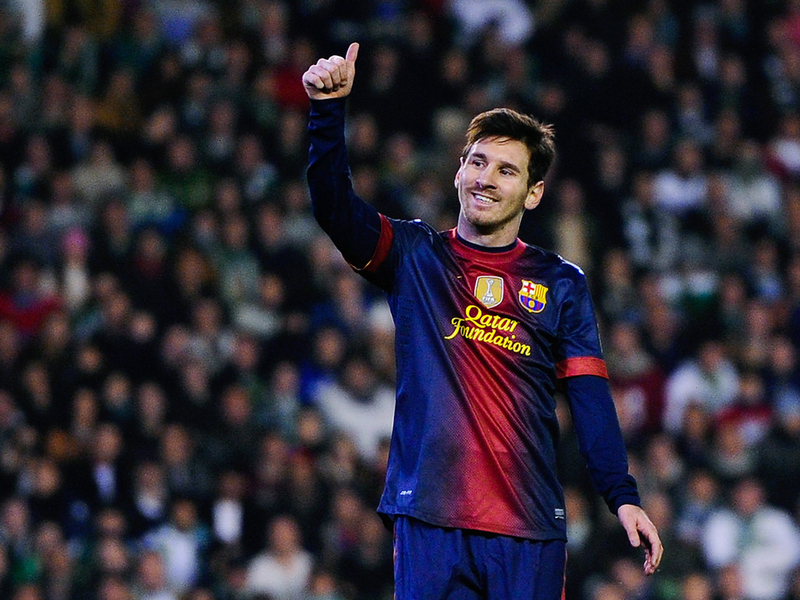 The Argentina forward scored twice to lead Barcelona to a 2-1 win at Real Betis in the Spanish league match. His first was an individual effort in the 16th minute to equal Mueller's mark, and he eclipsed the 1972 milestone with a familiar left-footed finish nine minutes later. "As I have said many times, the record is nice but the important thing is the victory that keeps us on the patch we want to continue on," Messi said. "As I always say, my objectives are on a team level: to win the league, the Champions League and the Copa del Rey again." Messi has scored 74 goals for Barcelona and 12 times for Argentina this year, and he has three more games in which he can add to his tally before the end of the year. Mueller scored 85 for Bayern Munich and West Germany. The 25-year-old Messi passed Brazil great Pele's single-season milestone of 75 goals for Brazil and Santos in 1958 with his 75th and 76th goals of the year on Nov. 11 to move into second place behind Mueller. After his record 50 goals in the Spanish league last campaign, Messi has led Barcelona to the best start in the history of the championship this season with 14 wins and a draw in the opening 15 rounds. The scoring ace has found the net 30 times already this season in all competitions for Barcelona. "We won't see another player like (Messi)," Barcelona coach Tito Vilanova said. "Not just because of his ability to score. But also for his ability to pass, play defense, and his understandings of the game. He is a global star that helps us in so many ways." Messi, who became a father for the first time on Nov. 2 to a baby boy named Thiago, was announced as one of the three finalists for the FIFA world player of the year award along with teammate Andres Iniesta and Real Madrid forward Cristiano Ronaldo. Messi has won the Ballon d'Or award for the past three years in helping Barcelona win three Spanish league titles and two Champions League crowns, along with various other competitions. He is seeking to become the only player to win the award for a fourth time when the winner is announced in Switzerland on Jan. 7. Iniesta participated in both of Barcelona's goals in Seville on Sunday, and Messi said he would be happy to see his teammate win the award. "If the Ballon d'Or is for Andres, he deserves it for everything he shows us game after game," Messi said. Nicknamed "The Flea" for his small stature and uncanny ability to slice through defenses, Messi has shattered several records during the past year. He scored 73 times in all competitions for Barcelona last season, breaking the previous European club record of 67 goals set by Mueller in 1972-73 and the prior world club mark of 70 established by Archie Stark of Bethlehem Steel in the American Soccer League in 1924-25. Fittingly, Messi scored his 73rd and final goal of the 2011-12 season as Barcelona beat Athletic Bilbao 3-0 in the Copa del Rey final in May to give then-coach Pep Guardiola his 14th title in his final game. In March, Messi passed Cesar Rodriguez's 57-year-old milestone of 232 goals to become Barcelona all-time leading scorer. He also equaled the record of 14 goals in a single European Cup competition last season, scoring five times in one Champions League match to set yet another mark. "Leo is supernatural," Barcelona defender Gerard Pique said. "He doesn't have limits. We'll always have to remember everything he gave us. We have to enjoy every minute we have with him."